Building Biology is the study of the effect of the built environment on the health of people, and Building Ecology is the study of the effect of the built environment on the environment. Through education, advocacy and research, the BBE Institute aims to make people aware of the health and environmental hazards of modern buildings and construction, and show them how to create healthier and more sustainable places to live and work in. Building Biology and Ecology was originally established in Germany in the 1970s and has affiliated offices in other parts of Europe, Australia, India, UK and the USA. The New Zealand Institute has been active in education and research in the country since 1990.
presentation session: "design your own eco home workshop"
To push the current boundaries of sustainability and ecological building towards a truly regenerative built environment. The practice of Baubiologie und Okologie or Building Biology and Ecology, is relatively new as a science, and has come about as the harmful biological and ecological effects of conventional building practices have sufficiently demonstrated the need for a more holistic approach. The field is far too comprehensive and the various subjects it covers are too inter-dependent for it to be labelled as a conventional science so it has developed independently as science in its own right. Building Biology and Ecology began in 1970, when the Gesundes Bauen - Gesundes Wohnen' (Healthy Building - Healthy Living) Society in Germany began collecting all existing knowledge on healthier and more sustainable building, including building practices that had been disappearing steadily over the previous fifty years. Early civilisations were of course inadvertent practitioners of Building Biology and Ecology because the only building materials available were natural ones. It is worthwhile for contemporary practitioners to look back and learn from what generations of trial and error taught these civilisations and apply this neglected knowledge wherever possible. As many conventional practices in the fields of housing and building development are essentially damaging to health and unsustainable, the promotion of the principles of Building Biology and Ecology has become essential, both for people and their environment. Neither is able to adapt to the onslaught of an ever-increasing array of toxins and pollution. Many studies implicate these by-products of development in the social and medical ailments of society today. In late 1989, architect Reinhard Kanuka-Fuchs introduced Building Biology and Ecology to New Zealand, and for over ten years he was the driving force behind awareness, education and change in this country. He developed basic awareness for ecological building in the NZ public, the architectural profession, the building industry and with building authorities. His key projects included the development of healthy home publications, as well as guiding the building of the Waitakere City Council Eco home and development of their Sustainable Home Guidelines, which encapsulate most of the BBE principles. He also trained many health practitioners, builders, architects, designers and manufacturers via university classes and the original German Correspondence Course, who now form a network of BBE professionals throughout NZ. The Building Biology and Ecology Institute is now run by some of these graduate students. The Institute continues to expand the beliefs of what living is, of what building is. Threaded deeply in the core of BBE teachings and philosophies are the subjects of geobiology, electrobiology, bio-harmonic design and sympathetic vibrational physics. The BBE Institute is a not for profit organisation, made up of Trustees, regional practising representatives around New Zealand, and a panel of advisors in related fields. Alex is Chairman of the Building Biology and Ecology Institute. His goal is to live in a “Garden of Eden” where the gardens, the homes and neighbourhoods are all as happy and healthy as the people living there! He was born in New Zealand but has also lived in Canada and Peru. His eco journey started during his early teens and has evolved into helping pioneer a pathway toward a more sustainable and regenerative architecture. He has taught eco architecture workshops in New Zealand for 15 years and more recently in India, as well as working with Prithwe Institute in India to create an eco architecture school. Alex is a practising architect with GreenHAUS architects annually contributing to the design of around 30 or so happy and healthier homes around New Zealand. When he’s not designing and teaching you can usually find him in the ocean - scuba and free diving - or on the beach with his family. Jenny is the Education Co-ordinator for the BBE Institute. She trained and practiced in architecture and became interested in healthy and sustainable building through enrolling in the original Certificate in Building Biology and Ecology correspondence course from Germany. 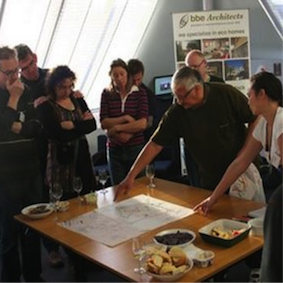 She has been involved with the BBE Institute through its various phases since 1990, developing and now running a NZ version of the correspondence course – the online BBE Certificate in Ecological Building and Design – as well as general administration. She also loves gardening, tree planting, community regeneration, music, writing and illustrating. Ingo Ratsdorf joins Johann Bernhardt as an Auckland BBE representative. He is a Registered Architect and a certified Building Biologist in both New Zealand and Germany, as well as a Green Star New Zealand accredited professional with over 14 years of experience. He walks the sustainability talk. His own passive solar house is built from predominantly untreated timber and uses on average half the electricity compared to the Waitakere NOW Home. He loves hands-on building, particularly with timber, clay and lime and is a big fan of Life Cycle Assessment, open source software, hiking, mountaineering and scouting. Brighid has a strong background in ecological design, education, research, sustainable housing, community buildings, self-build projects and educational buildings. Her deepest passion and interests lie in exploring human health, nature and the outdoors. "All of my architecture strives to help us to connect with the natural environment, to connect deeply with ourselves and to understand and utilize the vast potential to positively affect the vibration of the built environment, and therefore to positively affect our health." She is a Dru Yoga teacher and a Pranic Healer. She has been walking in the mountains of Scotland from an early age and still enjoys all the camping, tramping, fell running, mountain biking and cycle touring that Nelson has to offer. Sean is an Advisor based in the Central Plateau region of the North Island and a Registered Architect with a post graduate degree in sustainability from 2004. With 30 years’ experience in Architecture including Low Cost Housing Projects, Mudbrick, Straw Bale & Light Earth Infill HousingSean’s aim is to create a home that is healthy, using sustainable principles and a pleasure to live in. He is currently renovating his own home using the light earth infill technique utilising local pumice & clay infill to timber structure, clay & lime plasters for a breathable wall. Steve has recently achieved a Master's degree in Architecture, with a focus on low cost straw bale construction using a prefabricated modular design approach. His love of straw bale has led him to design several straw bale homes and he intends buiding one for himself and his wife. He also has a passion for doing more with less, and is always dreaming up new projects and carrying them out inventively. In the mid-1990s Mary ran a consultancy for 3 years measuring and reporting on EMF exposures in homes. In 2008 she started a postgraduate study focused on health and policy implications of young New Zealanders’ mobile and cordless phone use; following it with a post-doctoral Fellowship and PhD supervisor role in the Centre for Population Health Research on Electromagnetic Energy (PRESEE) at Monash, Melbourne. Now back in Wellington, she works as an independent researcher, educator and consultant. She considers there is a real need for policy-makers, parents and professionals who care for children’s health to learn enough about transmitting technology to be able to make informed decisions on their use of it. Paul began his working life as an Aircraft Engineer with Air New Zealand and has held senior management roles in Technical, Sales, Marketing and Information Technology and has also been a successful business owner. Several years ago Paul decided to bow out of the business world and focus on helping people to live more safely with modern technology. He completed a Certificate course in EMF Testing, part of the full Building Biology program from the Australian College of Environmental Studies and now operates a consultancy called SafeSpace. Paul now consults to home owners, architects and businesses, testing and providing practical remediation solutions against the negative health issues caused by Electro-Pollution.